Happy Easter and welcome to what, for me, has been a very enjoyable, but rather lazy, Easter Sunday in France. One Easter tradition we have always kept is sending Ed to the village boulangerie to choose his handmade Easter chocolate, something he has been doing by himself for over ten years. This year he chose a fish! 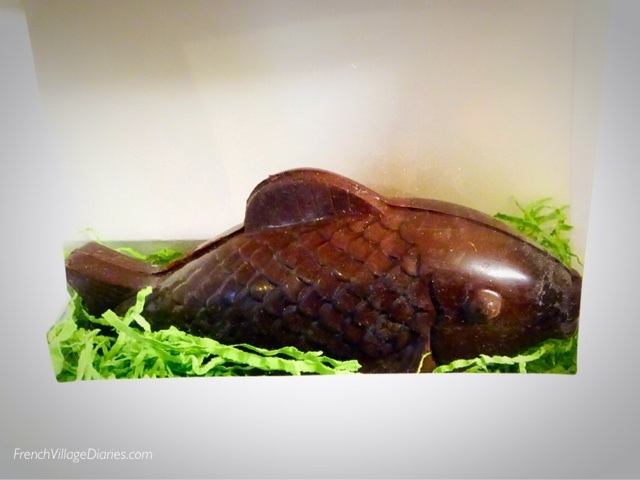 Yes, I know, but in France today is poisson d’avril, or April Fish (April Fools) day, so with Easter falling on 1st April, chocolate fish were a thing this year. I love that this one in it’s pretty gift bag, looks a little like it’s swimming in it’s own aquarium. To learn more about the French tradition of April Fish, you can read a great article by Margo Lestz here. 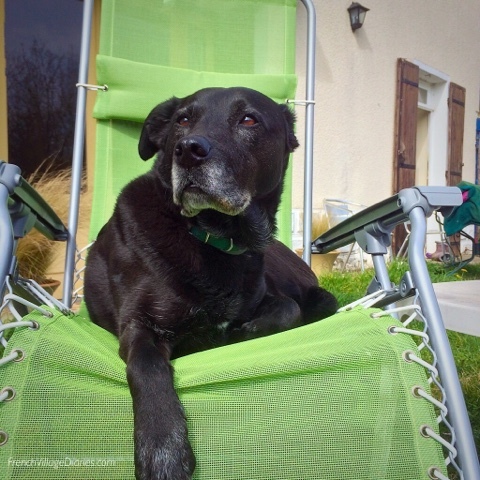 Today we took advantage of some warm, sunny weather, found the sun loungers and indulged in a bit of laziness. 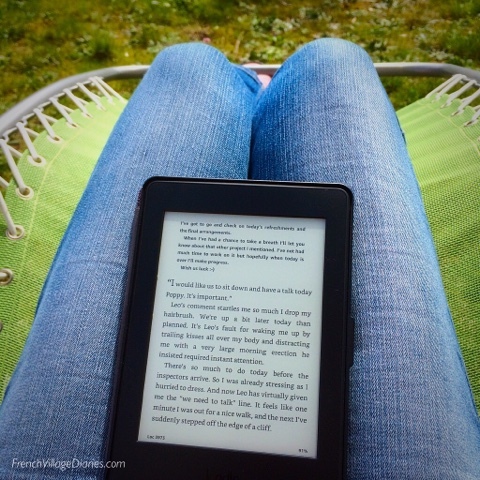 My kindle was happy to get my undivided attention and wow, there are some great new releases I’ve been lucky enough to take a peek coming out this summer. I can’t wait to share my reviews with you soon. We did think about mowing the lawn, however the village was oddly quiet today, with no sounds other than birds singing and occasional chattering voices, so it didn’t seem right to intrude with motors, and laziness seemed to win once again. We were however rewarded for our laziness; sitting quietly in the garden meant we got to watch the first returning swallows of the year, swooping above the garden before ducking into our barn. It always cheers me to see them back as it feels summer is one step closer. Even Mini the dog enjoyed a bit of R&R in the garden too. In our defence it’s been a hectic few days. Ed’s lycée put on their annual show this weekend and boy do French teens know how to put on a show. It is not a school of performing arts, although Ed does do Option Cinema, and this is the route he wants to follow at university, but every year the kids organise themselves into groups to run front of house, sound, lights, stage management, filming, props etc and together they decide what is performed, choreograph the dances, put together the musical arrangements and produce a fantastic event. It was interesting to see boys in France are as happy (and able) to dance as the girls and all the musical numbers showed as high a standard of playing (guitars, keyboards, drums, vocals, wind and brass) as we’d hear at the music school events. As someone who loved Grease as a teenager, it was somewhat surreal (but wonderful) to watch Ed and his friend Megan performing a superb (yes, I know, I’m biased) routine to “You’re The One That I Want” and seriously giving Olivia Newton-John and John Travolta a run for their money. We were somewhat spoiled to be able to watch Ed in two dance numbers and two musical numbers during the evening. The whole school did a great job and after the last night, they organise a party – another thing French teens do well. There is nothing quite like the smell of stale, rotting teen in the back of the car the morning after a party, actually scrap that, anything with that much alcohol in it is so well preserved it would never rot! Ed’s Saturday night morphed into Sunday, so when we got home this morning he soon disappeared to bed and didn’t reappear until gone 16h. At least my Sunday hasn’t been as lazy as his! I was however too lazy to do a traditional roast, even if it is Easter Sunday. We are not big roast dinner people, but I did roast some pork, then boil the bones to make a stock, all of which was used to make a delicious roast pork and mushroom risotto this evening. I hope you have all had a lovely Sunday too.